If you travel to Las Vegas, Knoxville, Chicago, and Salt Lake City one of the surprising trends you’ll see is the abrupt shift in housing markets. Downtowns in these and other cities are outpacing the suburbs in new home construction and existing home sales. Two of the critical reasons for both are the shrinking size of American households — not a new trend — and the fact that transportation costs exceed housing expenses in household budgets. Though builders are intent on constructing the 3,000 square foot McMansion in the distant suburb, the fact is that there are far fewer households than there once were capable of both filling them up and being able to afford to get there in the first place. Let’s tease out both trends. The US Census Bureau noted earlier this year that the conventional American nuclear family — husband, wife, and kids under one roof — now composes less than a quarter of all households. The Census Bureau also reported that single people now make up the majority of US households. 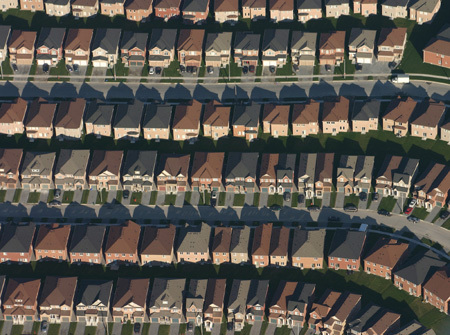 Long story short: the market for those cul-de-sac McMansions is shrinking. The downward slide in new suburban home sales is further exacerbated by reckless lending practices, static or shrinking family incomes, traffic congestion, and the growing popularity of downtown living shared by young people and retirees alike. The other major influence in the soaring interest in American downtowns and shrinking housing markets at metropolitan edges is the cost of transportation, now the number one expense in the majority of American households, according to a study by the Center For Housing Policy in Washngton, D.C. Researchers evaluated households that earned from $20,000 to $50,000 — the majority of households, by the way — in 28 metropolitan regions. They found that on average households spent 30 percent of their monthly income on transportation and 28 percent on housing. Such supposedly low cost cities like Atlanta were actually very high cost places to live. Atlantans spent 32 percent of their income on transportation, more than supposedly high cost cities like New York (24 percent), and Washington, D.C. (28 percent). In fact, when transportation and housing costs were combined Atlanta — one of the most sprawled out, drive through places in the world — was the second most expensive metropolitan region in the nation, next to San Francisco. Detroit, by the way, had among the highest transportation costs (31 percent) but also near the lowest housing costs (24 percent of household income), the researchers found. What does it mean for patterns of American development? The old rules of the housing/income/time/distance game have changed. Working people sacrificed their time in order to find decent housing distant from their jobs. Their commutes in relatively inexpensive vehicles with cheap fuel made it work economically. No more. Vehicles are expensive to buy and maintain and insure. Fuel prices are rising fast. For every dollar people spend each month on housing in the distant suburbs, they’re spending as much or more on transportation. Living far away just doesn’t cash flow like it once did. And that reality is translating into depressed suburban housing markets, downtown redevelopment, and Mode Shift projects occurring all over the nation to finance and build new forms of work force housing and rapid transit systems. Very soon researchers may find that the footprint of major American metropolitan regions has begun to stabilize and then shrink.